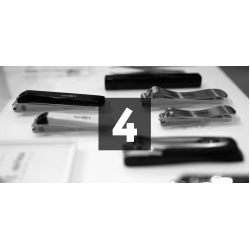 KAI offers 4 ranges of nail clippers in different designs. Especially handy: all nail clippers also come with a nail file and a plastic nail collecting container in order to make the manicure and pedicure easy and hygienic. Perfect for the precise trimming of finger and toenails. The rounded or straight stainless steel blade (depending on model) allows you to work precisely in order to give the desired shape and length. The different nail accessories are available in up to three different sizes (depending on model). Why KAI nail clippers? Careful workmanship and attention to detail appeal to both design enthusiasts and people who appreciate exceptional quality and high functionality.